Take National Highway #292 toward Shigakogen from Shinshuunakano Exit on Joushin’etsu Expressway. At Hasuike junction, turn toward Ichinose and Okushiga. Approx. 50min.drive from Shinshuunakano Exit. * From Nagano station(JR), taxi service to Okushigakogen is available. At Nagano station(JR), change to Nagano Dentetsu(private railroad) to Yudanaka terminal. At Yudanaka station, bus service to Okushigakogen is available. From Nagano station, express bus service is available at Nagano station East Gate bus terminal(Bus Stop #23 or #24). * Nagaden Express Bus is available at JR Nagano station. For the time table and charge, please contact us. 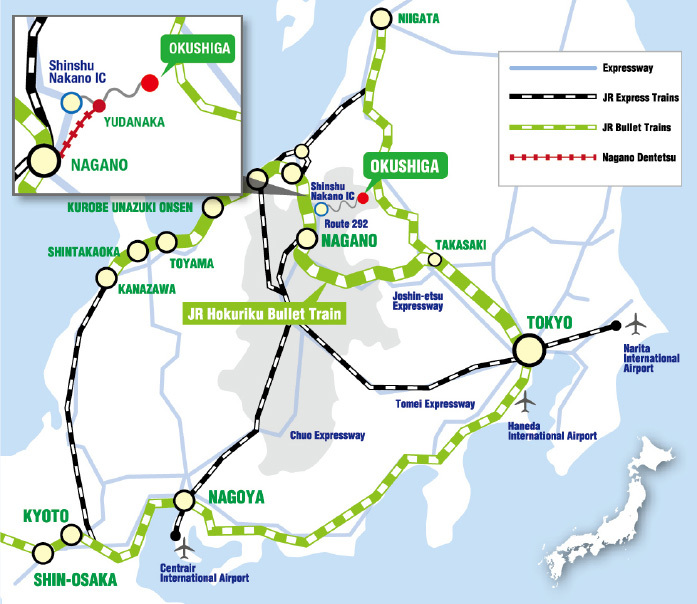 From the international airports, Narita, Haneda, Kansai or Centrair, take the commute train to JR station, Tokyo, Osaka or Nagoya and transfer to the JR trains above mentioned.